Michael Glassman is an award winning landscape designer and the owner of one of Northern California's most prestigious design firms. For more than thirty years, he has designed beautiful and functional landscapes, waterworks, and creative elements that enhance outdoor living. Michael received his degree in Landscape Architecture and Horticulture from the University of California at Davis and studied at La Napoule Art Foundation in Southern France. Michael has published seven books. His newest book, The Garden Bible, co-authored with writer Barbara Ballinger, is a step-by-step guide to planning and problem solving landscapes so that gardens will grow, evolve and be sustainable for years to come. Michael's landscape design solutions and philosophies were the subject of Gaining Ground by Maureen Gilmour, with whom he co-authored Waterworks. He has published two other landscape design books, Garden Getaways: Havens at Home and Outdoor Designs for Living. With the director of DIY's Garden Police, Lisa Ely, Michael wrote three books about gardening for children: Kinder Gardens: Growing Inspiration for Children, Kinder Gardens: Games and Adventures, and Kinder Gardens: Autumn Fun. All of his books can be purchased through this website. Michael's work has been featured nationwide. His landscape designs were the subject of nearly fifty Sunset magazine articles. He has also published in Better Homes and Gardens, Cooking with Paula Dean, This Old House Magazine, Garden Design, Backyard Designs, Great Backyards, Landscape Architecture and K+BB. He was the spokesperson for the American Home Furnishings Alliance (AHFA) and was honored three times by the American Horticultural Society, which selected his gardens to be on their tours in Northern California. Michael Glassman & Associates has been awarded Best of Houzz for client satisfaction in 2013, 2014 and 2015. 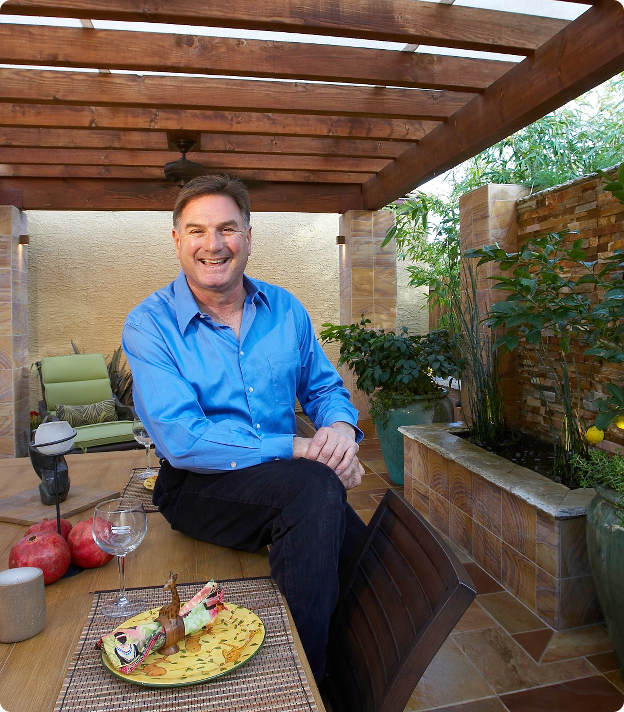 Part environmental evangelist, part landscape design coach and connoisseur, Michael was co-host and designer of Discovery Home Channel's series Garden Police. He designed projects on HGTVs Gardening by the Yard with Paul James, and now appears regularly on DIY's Yard Crashers. His sustainable landscaping ideas were featured on CNN's Glenn Beck Show. His pool designs were featured on a HGTV special Spectacular Pools. He won the second best outdoor kitchen design in the nation on HGTV Sizzling Outdoor Kitchens and 8th best backyard landscape design on Bodacious Backyards. He can be seen discussing gardening, landscape design and problem solving landscaping tips with Sac and Company. Michael's clients are always amazed by his expert vision in unifying the interiors and exteriors of their homes, while finding beauty in their natural outdoor settings that are coaxed by his creativity into works of art. houzz is a collaborative platform for residential design that brings homeowners and professionals in a uniquely visual community. Click on the link below to see client reviews and more of Michael's work.